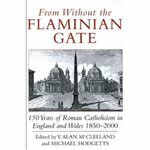 "From without the Flaminian Gate : 150 years of Roman Catholicism in En" by V. Allen McClelland, Michael Hodgetts et al. Jeffrey P. von Arx is a contributing author, "Catholics and Politics", p. 245-271. From Without the Flaminian Gate is a collection of articles which discusses aspects of the development of Roman Catholicism from 1850 to the present. It recognizes the slow but steady growth of the Catholic Church following the restoration of the hierarchy and considers the more recent developments in the life of English Catholicism, especially the influence of Vatican Council II. Jeffrey von Arx effectively argues that Roman Catholics did contribute to the political life of the country, although not following the continental approach of Catholic Action. -- Synposis of a review written by Rene Kollar in The Catholic Historical Review 86.4 (2000) 696-697 .
von Arx S.J., Jeffrey P. "Catholics and Politics" in From without the Flaminian Gate : 150 years of Roman Catholicism in England and Wales: 1850-2000 By: McClelland, Vincent Alan (Editor); Hodgetts, Michael (Editor). London: Darton, Longman & Todd, 1999, p.245-27. McClelland, V. Allen; Hodgetts, Michael; and von Arx, Jeffrey P. S.J., "From without the Flaminian Gate : 150 years of Roman Catholicism in England and Wales: 1850-2000" (1999). History Faculty Book Gallery. 7.